Universal Design is design for everyone, for every time in their lives. Don't let anybody tell you that your house has to ﻿looks functional in order to be accessible. Picture yourself in a functional house. It’s plain, but it works. Then picture yourself in a gorgeous house that ALSO works perfectly for you. You CAN have them both. Functional isn’t enough. On the other hand, beautiful is not enough. If you buy a gorgeous pair of shoes, but find you can’t walk in them, what good are they? Some designers will sell you THEIR standard of beauty, but they may not be able to design around your physical body, and especially your changing physical body….If you build your dream house, you want to be able to live in it, all through your life; you want it to fit you perfectly at EVERY level. Above all, you want to avoid the nightmare scenario (we've met people who have gone through this): they’re all done with their project, but dissatisfied that it came out too utilitarian; all brains and too little heart. You COULD live there there rest of your life, until you die, but you just...wouldn’t WANT to. Don’t let that happen. Are you wondering what "Universal Design" is? It's a phrase that encompasses but goes beyond "wheelchair-accessible design", "ADA compliance", Aging In Place", and other ideas about making places that work well for people regardless of disability, and at any time in their life. 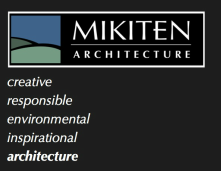 Mikiten Architecture is uniquely qualified as experts in the field of Universal Design, accessible architecture, the ADA, and aging-in-place. 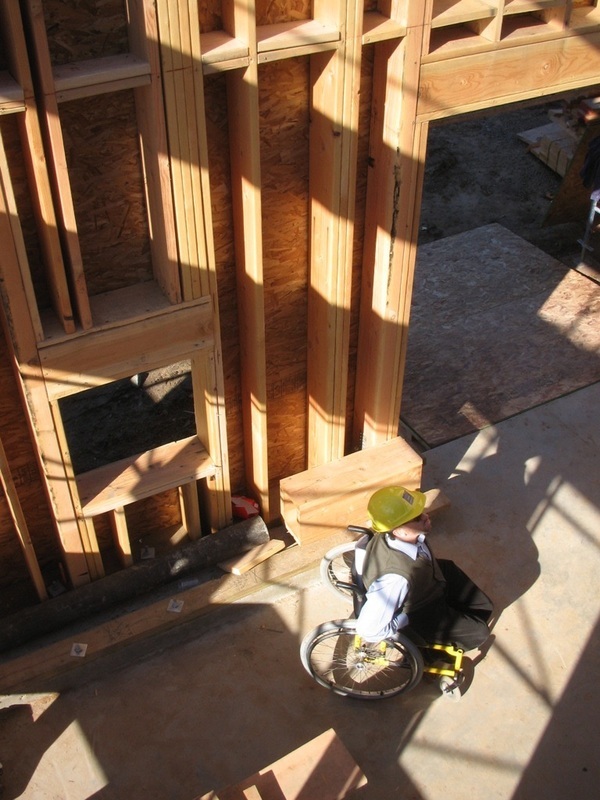 As a wheelchair-riding architect, Erick Mikiten, AIA, has a deep and first-hand understanding not only of the need for architectural designs that are usable by everybody, but also a real ability and insight into how to accommodate those needs. Elisa Mikiten was trained in universal design at the world-renowned Adaptive Environments Center in Boston, Mass. She worked independently on numerous accessibility renovations and upgrade projects before collaborating with Erick Mikiten on a major residential addition for a couple with Multiple Sclerosis. And therein our firm was born. Although we have provided accessibility survey and upgrade services to clients, our strength is in the incorporation of Universal Design into all aspects of our work. Our vast experience leads to environments comfortable and usable for more people than anything designed to the minimum requirements of the ADA or building code. This is a passion that we bring to all our projects - making the world more usable by all of us for more of our lives one building at a time. I’ve used a wheelchair all my life, which has given me incredible insights into the environment around all our bodies. This has been invaluable for all the Universal Design projects we’ve done. But through my own experiences ranging from rolling over piles of lumber at construction sites, to setting up a wood shop to build custom furniture myself, to sailing on the San Francisco Bay, I always focus on the exciting possibilities ahead. My architecture does the same. This makes me a VERY careful designer. What works for me may not work for you, even if you were using a wheelchair, too! 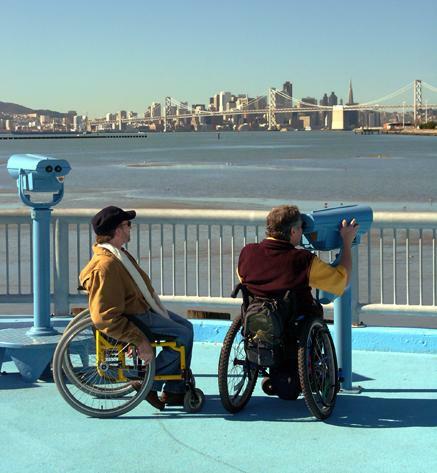 There are only three or four architects on the West Coast who are wheelchair riders. Being a wheelchair rider gives me deep Universal Design insights, which actually lead to deeper insight into ALL design. This means spaces that not only work amazingly well for you and your family’s bodies AND spirits NOW, but as those change into the future. I’m talking about houses that inspire both because they are stunning and sculptural, and gracious, but also because the DEEPLY recognize who YOU are. Look at the tired old symbol on the left. It's static, rigid, and passive. The person is angular and stiff. Stuck, you might say. Now look at the image on the right. And rounded like a person. We use the symbol on the right in all our projects, and are getting other architects to do the same. Disability means something different now than it did even ten years ago. Think about how omnipresent this symbol is. It's time to update how people with disabilities are presented, and we're making that happen.